Sharma, a 36-year-old Indian zoologist, has studied the endangered cats in Mongolia’s Southern Gobi region since 2007. His presentation was part of a recent workshop in Bishkek, when Kyrgyz government officials and leading scientists met with representatives of several international non-governmental organizations (NGOs) to discuss coordinating efforts to count snow leopard populations in the country, and the wider region. It is no easy task. 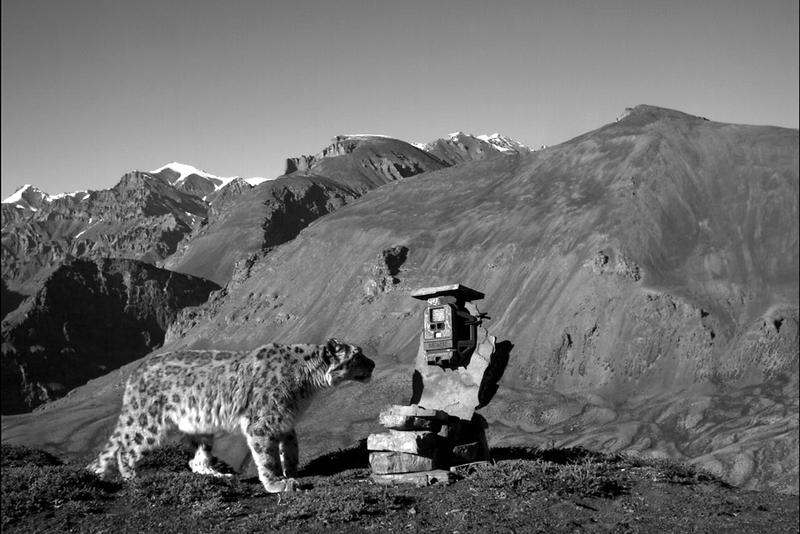 Snow leopards have earned the moniker “the ghosts of the mountains” for a reason. The elusive cats live in remote regions, often at altitudes of 3,000 to 4,000 meters. They usually forage and hunt at night and their black-and-off-white coats serve as perfect camouflage in the snowy mountain landscape. Their fur has also been a reason for the cats' demise. Because of the high prices it earns on the black market, snow leopards have been poached mercilessly since Kyrgyzstan gained independence from the Soviet Union in 1991. The expansion of livestock breeding and infrastructure also has hastened the cats’ decline. Today, the International Union for the Conservation of Nature says snow leopards are endangered, facing a high risk of extinction in the near future. The snow leopard is unique to the high mountains of inner Asia, including the Altai, Tian Shan, Pamir, Hindu Kush and Himalayan ranges. Up to 6,400 are thought to be left in the wild, including an estimated 300 in Kyrgyzstan. Kuban Zhumabai uluu, head of the Seattle-based Snow Leopard Trust’s Bishkek branch, explains that counting them helps protect the cats: “This information allows us to identify the areas we need to focus on to conserve the snow leopard. To find out if there are snow leopards in a given region you can look for paw prints, scratchings, urine markings and feces,” he said. Motion-sensing photo and video cameras – known as “camera traps” – offer a new tool to estimate population sizes. Zhumabai uluu and Sharma, who also works for the Snow Leopard Trust, recently installed 40 traps in the Sarychat-Ertash Nature Reserve in Issyk-Kul Province, one of the most-studied areas for snow leopards in Kyrgyzstan. “The snow leopard’s coat pattern is unique, like a fingerprint. This allows us to distinguish individuals, provided that we can photograph them from both sides. For this reason, we install the cameras close to the cats’ scent-marking sites: Usually they sniff the rock and then turn around to urinate," Sharma explained. Coordination among conservation groups has been a problem to date. In addition to the Snow Leopard Trust, several NGOs started working with photo traps in Kyrgyzstan last year, including the German Nature and Biodiversity Conservation Union and the World Wide Fund for Nature. Each has developed its own trapping strategy, effectively reinventing the wheel, resulting in overlap. “At times, you could find three different cameras tied to the same rock,” Zhumabai uluu told EurasiaNet.org. The March workshop, designed to coordinate monitoring, was a result of a World Bank-sponsored Global Snow Leopard Conservation Forum held in Bishkek last October, when 12 regional states – including China, India and Russia – acknowledged “the snow leopard is an irreplaceable symbol of our nations’ natural and cultural heritage.” They vowed, at the urging of Kyrgyz President Almazbek Atambayev, to coordinate their activities through a Bishkek office. The countries also pledged financial support for the Global Snow Leopard Ecosystem Protection Program (GSLEP), which includes an initiative to engage local communities in efforts to combat poaching. The ultimate goal is to secure 20 healthy populations of snow leopards by the year 2020, each with at least 100 breeding-age cats and sufficient abundance of wild prey. The whole project is slated to cost $190 million, with half the money coming from the international donor community and the other half from national governments. But it is unclear how impoverished countries like Kyrgyzstan and Tajikistan, which consistently fail to provide their residents with basic social services, are going to contribute financing. Some conservationists see a white elephant in the GSLEP project and fear it may be driven too much by politics and vanity. Tanya Rosen of Panthera, another US-based organization working for the protection of big cats, which also operates photo traps in Tajikistan and Kyrgyzstan, says several smaller cross-border projects would be more effective than this giant project. “We are worried that it will consume resources instead of creating them. The organization of infrastructure and meetings could detract funds from the actual conservation work,” Rosen told EurasiaNet.org.